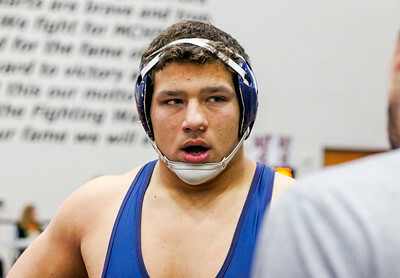 Kyle Grillot - kgrillot@shawmedia.com Greyslake Central sophomore Mikey Andrews takes a nap in the bleachers in the McHenry High School gym during the Fox Valley Conference wrestling meet Saturday, January 31, 2015. 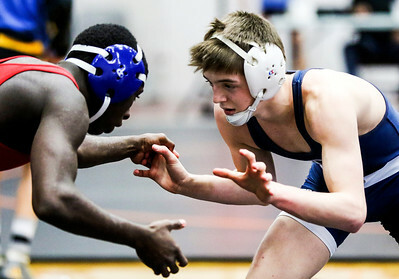 Kyle Grillot - kgrillot@shawmedia.com Cary-Grove's Sean Cullen (left) warms up before his match with Dundee-Crown's Javon Mayfield faces off with during the 132-pound match in the Fox Valley Conference wrestling meet Saturday, January 31, 2015. 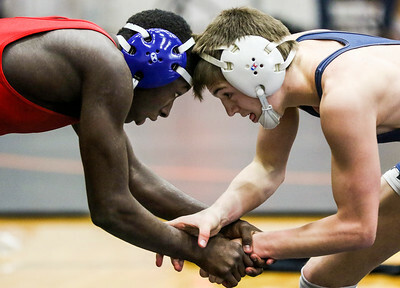 Kyle Grillot - kgrillot@shawmedia.com Dundee-Crown's Javon Mayfield faces off with Cary-Grove's Sean Cullen during the 132-pound match in the Fox Valley Conference wrestling meet Saturday, January 31, 2015. Kyle Grillot - kgrillot@shawmedia.com Dary-Grove's's Michael Gustafson (left) wrestles with Jacobs' Loren Strickland during the 160-pound match in the Fox Valley Conference wrestling meet Saturday, January 31, 2015. Strickland won the match. Kyle Grillot - kgrillot@shawmedia.com Jacob's David Dudych (left) wrestles Dundee-Crown's Adam Gutierrez during the 126-pound match in the Fox Valley Conference wrestling meet Saturday, January 31, 2015. 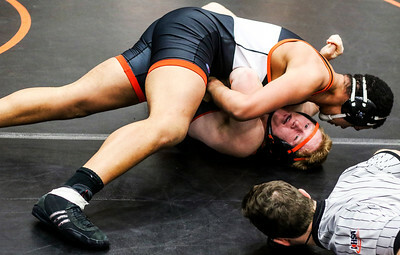 Kyle Grillot - kgrillot@shawmedia.com Crystal Lake Central's Romeo McKnight pins McHenry's Ryan Grannemann during the 220-pound match in the Fox Valley Conference wrestling meet Saturday, January 31, 2015. Kyle Grillot - kgrillot@shawmedia.com Dary-Grove's's Michael Gustafson (right) wrestles with Jacobs' Loren Strickland during the 160-pound match in the Fox Valley Conference wrestling meet Saturday, January 31, 2015. Strickland won the match. Kyle Grillot - kgrillot@shawmedia.com Woodstock North's Randy Kline (left) wrestles with Hampshires Anton Krocko during the 170-pound match in the Fox Valley Conference wrestling meet Saturday, January 31, 2015. 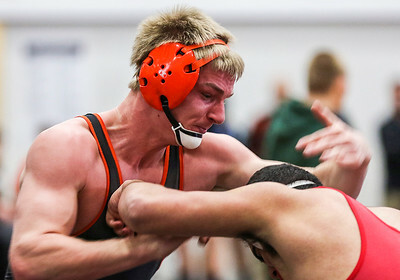 Kyle Grillot - kgrillot@shawmedia.com McHenry's Cam Pait wrestles with Huntley's Petros Mihalopoulos during the 182-pound match in the Fox Valley Conference wrestling meet Saturday, January 31, 2015. Pait won the match. 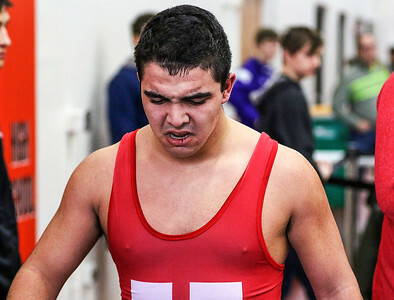 Kyle Grillot - kgrillot@shawmedia.com Huntley's Petros Mihalopoulos reacts after being beat by McHenry's Cam Pait in the 182-pound match during the Fox Valley Conference wrestling meet Saturday, January 31, 2015. Pait won the match. 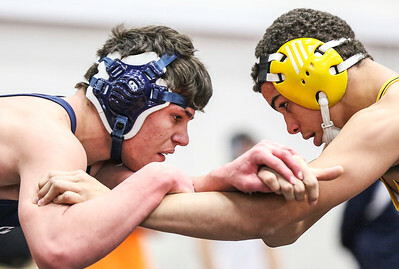 Cary-Grove's Sean Cullen (left) warms up before his match with Dundee-Crown's Javon Mayfield faces off with during the 132-pound match in the Fox Valley Conference wrestling meet Saturday, January 31, 2015.